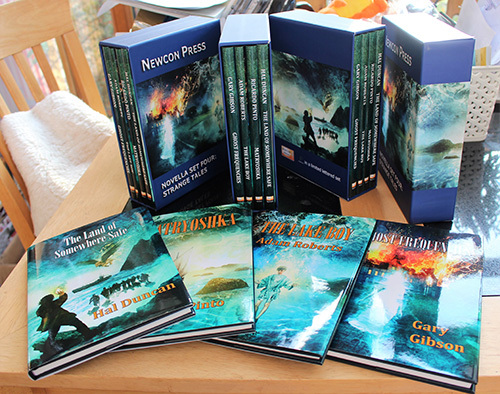 A Limited Edition Slipcase Set containing signed hardbacks of the four independent novellas that comprise the 'Strange Tales' quartet: four tales of weird science fiction and off-kilter fantasy from four master storytellers. Susan MacDonald knows she’s close to perfecting a revolutionary new form of instantaneous communication, but unless she makes a breakthrough soon her project will be shut down. Do the odd sounds – snatches of random conversation and even music – that are hampering her experiments represent the presence of ‘ghosts’ as some claim, deliberate sabotage as suggested by others, or is there a more sinister explanation? Cynthia lives in a lakeside parish in Cumbria, where none suspect her blemished past. Then a ghostly scar-faced boy starts to appear to her and strange lights manifest over Blaswater. What of the astromomer Mr Sales, who comes to study the lights but disappears, presumed drowned, only to be found wandering naked days later with a fanciful tale of being ‘hopped’ into the sky and held within a brass-walled room? What of married mother of two Eliza, who sets Cynthia’s heart so aflutter? Lost in Venice in the aftermath of the war, Cherenkov just wants to put his head down somewhere and sleep, but her copper hair snares his eye. She leads him to Eborius, a baroque land lost in time, and takes him on a pilgrimage across Sargasso seas in search of the Old Man, who dwells on an island where time follows its own rules. Last of his kind, the Old Man is the only being alive who may hold the answers Cherenkov craves. 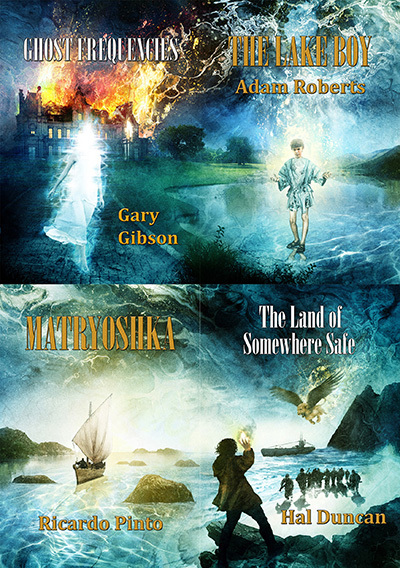 Each slipcase features Ben Baldwin's combined artwork as a wraparound.